Home - Say It Now! Say It Right! Need a creative, no-nonsense speaker for your next conference or meeting who will get people talking and your team working together? Mary Nestor’s keynotes and seminars get people talking, sharing, interacting and practicing constructive communication to solve problems and generate ideas. Every business needs a little help now and then. If you’re tired of wasting time and money on consultants who don’t deliver, Mary Nestor can get your company working together with no-nonsense, practical consulting techniques customized to your organization. A free team building experience for companies, associations, non-profits, groups and teams who want to improve communications, strengthen relationships, and discover connections that get people communicating, valuing and appreciating each other’s life experiences. Brian Tracy, Author of "Speak to Win"
Keeping silent in critical moments in business, relationships, organizations—life moments—results in lost opportunity, broken relationships, disastrous decisions, and lost money, time, morale and creativity. SAY IT NOW!SAY IT RIGHT! is a straightforward and humorous look at the serious problem people and organizations face by not speaking up, sharing ideas, voicing concerns, or disagreeing with bad decisions. This brilliant book is a communication roadmap to strategically guide you from where you are to where you want to be. 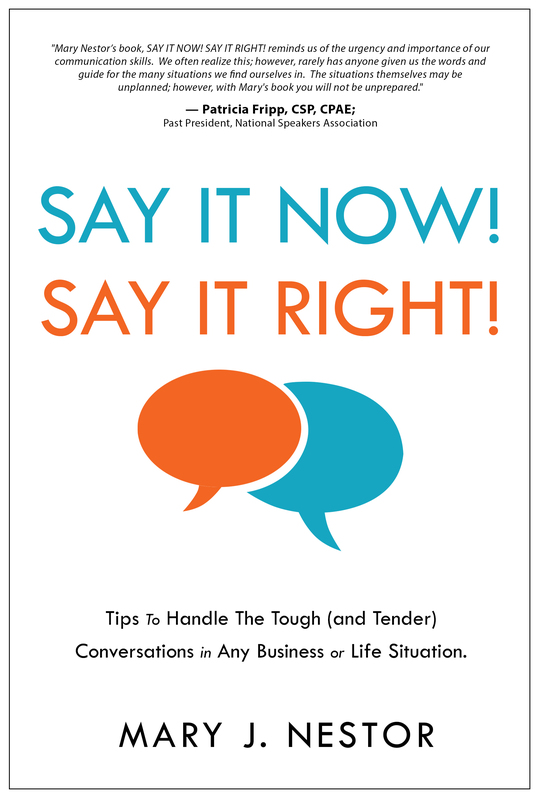 Do you want healthy, supportive relationships wherein everyone feels safe enough to express their needs in a clear, concise and respectful way? Then buy this book. In fact, buy several copies so you can share it with people you love and/or work with. Watch everyone's life transform for the better!